I was excited to read this study published by the The Journal of Nutrition Nutrition and Disease about polyphenol rich dark chocolate. Apparently glucose-intolerant hypertensive subjects had their blood pressure reduced and insulin sensitivity increased by simply consuming high polyphenol dark chocolate. This has the potential to be life changing for those struggling with uncontrolled high blood pressure or insulin sensitivity or diabetes. Polyphenol rich, flavonoid rich dark chocolate appears to be the only chocolate to consume to confer these benefits. Dark Chocolate sold in stores and shops tends to be processed the traditional way which includes a “dutching” process. Dutching occurs when chocolate is heated at high temperatures for long periods of time to get rid of the bitterness in the chocolate and make it smooth. Unfortunately this process gets rid of up to 80% of the polyphenols and flavonoids, the antioxidants so important in dark chocolate. This is why cold pressed dark chocolate is recommended. Cold Pressed chocolate is not heated or dutched like candy and retains the antioxidant properties in the original cacao which dark chocolate is made from. I am aware of only one company that uses a patented cold pressed technology to make their premium dark chocolate. The chocolate is made by The Healthy Chocolate Company in Reno, Nevada and is called “Beyond”. This healthy chocolate is sweetened with Acai and Blueberry. It does not contain waxes, fillers and processed sugars like the candy we are used to. In fact, the Beyond power square is just 33 calories per piece. It would seem that the chocolate to eat would be the one that provides the most antioxidant, flavonoid and polyphenols in the dark chocolate. 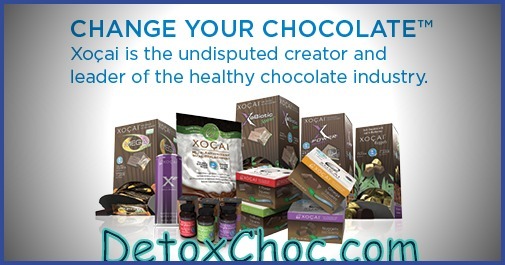 Beyond chocolates offer Nuggets, Power Squares, Xobiotic Squares with a probiotic, Omega Squares with flaxseed, Xo Love Chocolate love bites to increase passion and Beyond peanut butter cups. They also have a line of drinks including Activ, Xe healthy energy drink and the Beyond protein shake (Chocolate Diet) that also include these benefits. More information on Beyond, The Healthy Chocolate Company chocolate is available at MyChocolateVitamins.com. You can also call direct for information at 941-216-5727. Are You Passionate About Chocolate? SW Florida Beyond Growth Approaching 200,000th promoter!